A couple of weeks ago I got this SITA-OFFICE standing desk at work. I’ve been having some problems with tight glutes (piriformis muscle pain) and sitting at my desk for extended periods was making it worse. My physiotherapist advised that I need to sit less and stand more so my company got me an adjustable standing desk. This desk has been a HUGE game changer for me. Not only is my glute less tight and sore at the end of the day but my hips, lower back and guads feel so much better. So much so that my natural flexibility has even improved a little bit. I stand at 196 cm tall (6’5) so, like many things in this world, I had to modify how I use this desk. The desk is a simple two tier construction that is comprised of a top shelf and a keyboard shelf. You can comfortably fit two monitors or one laptop and one monitor on the top shelf. Regardless of your monitor setup there is plenty of space in front of the monitors for all your standard desk items like pens, paper and your coffee mug. 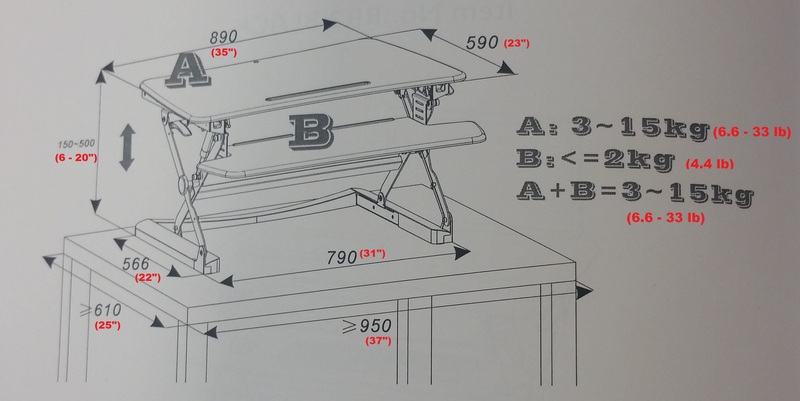 The keyboard shelf is removable but the angle of it cannot be adjusted nor does it slide out, it is stationary. 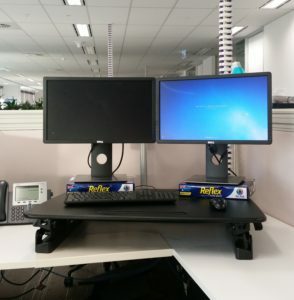 Unfortunately you cannot adjust the height at which the keyboard shelf sits; it sits flat on the desk at the lowest setting and is about 4 inches (10 cm) below the monitors when the desk is at the top position. The desk itself weighs approximately 15 kg (33 pounds) and the removable keyboard shelf is about 2 kg (4.4 pounds). Despite not weighing much, when you lift the desk I suggest you get someone to help you as the desk is awkward to handle and can move up and down. As you can probably tell from the above photo, I had to make a few modifications to my desk. Firstly, the keyboard shelf was too low for me when I was standing so I removed it. For good ergonomics your elbows should be at 90 degrees to your desk and keyboard. When I was standing the bottom of the keyboard shelf was at least 30 cm too short for me. To overcome this I simply positioned my keyboard and mouse on the top shelf. There is plenty of space on the top shelf so my mouse movement is not restricted in any way. Secondly, the monitors were too low for me. For good ergonomics your line of sight should be in line with the monitors when looking straight ahead. In my case the centre of the monitors was below my line of sight. This was easily fixed by placing a ream of paper underneath each monitor. With my current setup when I’m sitting at my desk the keyboard and mouse are too high. To overcome this I simply pull the keyboard and mouse towards me, off the standing desk, and place them on the white desk in front. I’m fortunate that the keyboard and mouse cables are long enough to allow me to do this. 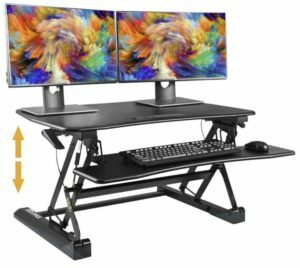 If your keyboard and mouse cables are too short you can simply attach the keyboard shelf to the desk and use that instead. Despite these inconveniences I still think having an adjustable desk is worth it. If you are not accustomed to standing for long periods of time make sure you take regular breaks to sit down. 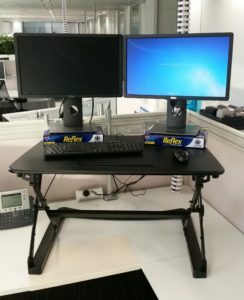 When I first started using this desk I would get sore legs and a slightly sore lower back. 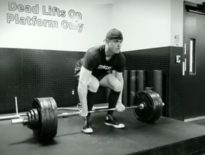 The reason for this was that I’ve spent so much of my life sitting down that my body was not used to doing what it’s naturally made to do – stand up! 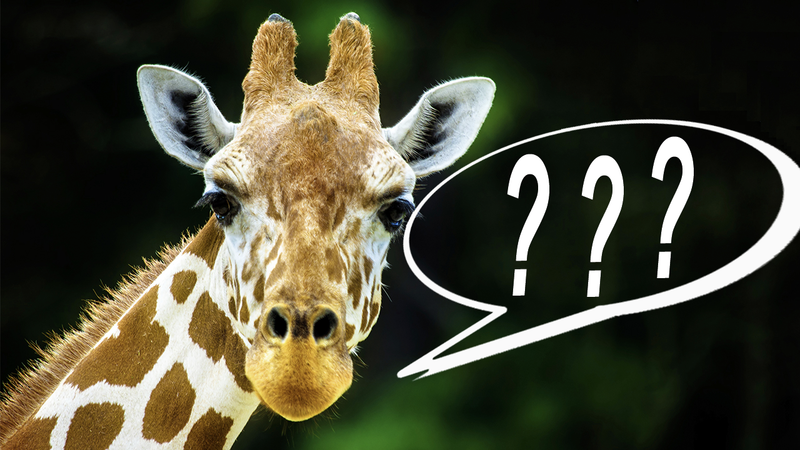 A good starting point would be: for each hour, stand for 15 minutes then sit for 45 minutes. Once you get used to this then increase the length of time that you stand and reduce the time you spend sitting. When you start standing for longer periods you may want to consider investing in a standing mat. Not only do they provide exceptional comfort on your feet but they help prevent fatigue in your legs. Overall, this desk isn’t built ideally for my height but after some simple adjustments it fits me really well. Having the ability to stand up for a few hours each day makes such a huge impact to my overall well being. The desk is incredibly simple to assemble and move, and the addition of a standing mat is the icing on a cake. I cannot recommend enough that everyone gets one of these desks. 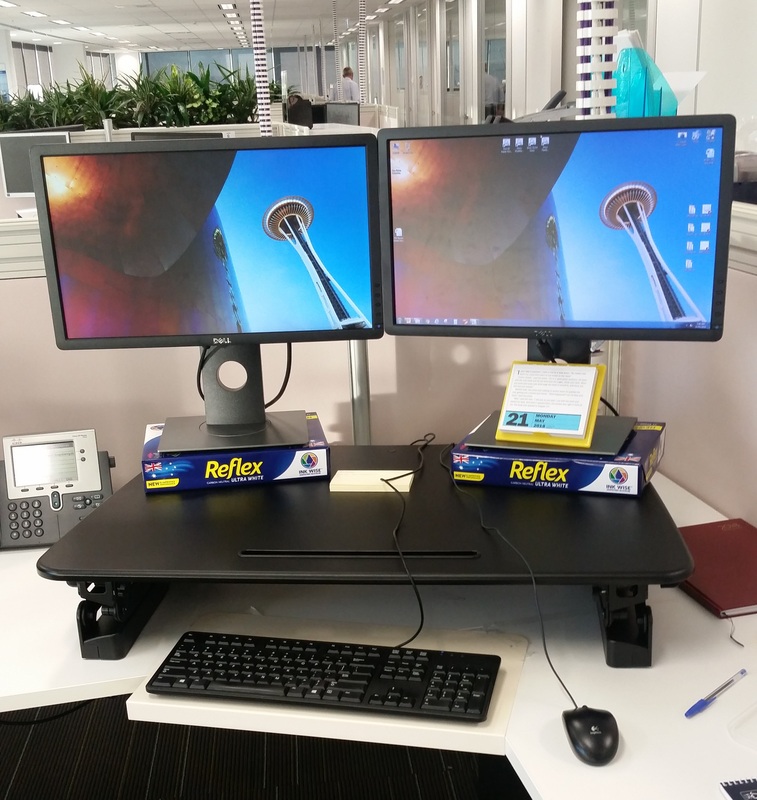 If you are interested, you can get the same sita-office standing desk here.